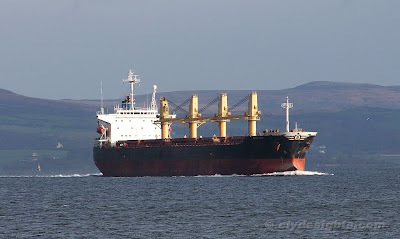 Built in 1997 by the Tamano Engineering and Shipbuilding Co in Japan, the bulk carrier GOLDEN ELPIS was originally named ASIAN HAWK. In 2005 she became ASIAN HOPE, a year later becoming firstly ABG NARAYANA and then ELPIS, before being given her current name in 2008. She is 189.8 metres in length, with a deadweight of 46,645 tonnes, and had been discharging a cargo of animal feed at Shieldhall. While loading the cargo in Santos, Brazil, it appears that GOLDEN ELPIS suffered from a hold fire. On arrival at Glasgow, she was given a Port State Control survey which resulted in her detention for certain deficiencies; these were rectified prior to her departure. She is owned and managed by Greek companies, and is currently on charter to a Swiss-based concern.